What Happened To America? Assassination Attempts And Threats Are Being Sanctioned - Where Is The Outrage? Love her or hate her, Pamela Geller has been one of the defining voices over the years warning of the erosion of American freedoms, guaranteed by the US Constitution, and she has courageously put her life on the line to prove her assertions..... ironically it was ISIS and/or ISIS sympathizers that finally made her point for her, helping escalate her fight for America's liberties to the headlines of every major news outlet. Recently Ms. Geller helped sponsor a "Draw Muhammed" contest, where two men wearing body armor, carrying assault rifles, one of which declaring loyalty to ISIS, were killed after trying to ambush the event which was held in Garland Texas. Over the years I have watched Ms. Geller attempt to wake up the masses to what has been happening, in America, right under our noses, she has been called a "hate monger," been called an "Islamophobe," among other charges because she asserts that the US has been insidiously heading toward a place where "Sharia Law" replaces US law, turning America, the Land of the Free into Amerika where the US constitution is nothing more than paper with no meaning. 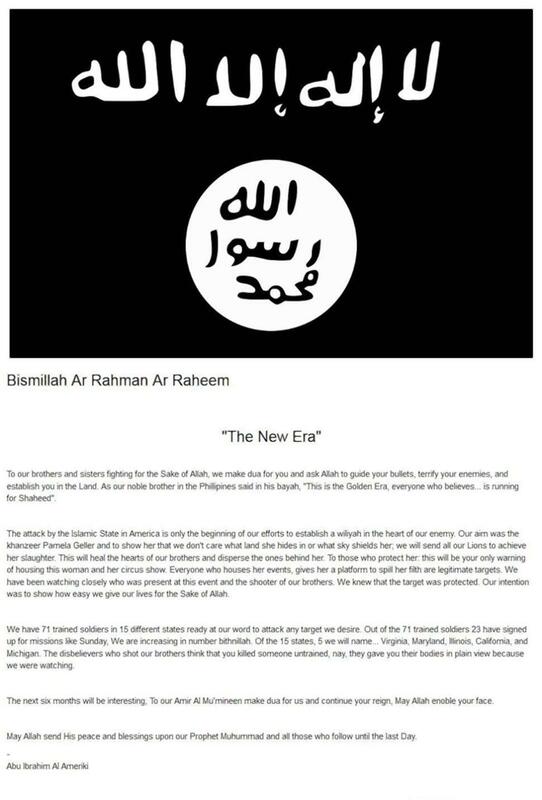 ISIS has now openly called for the death of Ms. Geller and anyone that protects her, with further assertions that there are "71 trained soldiers in 15 different states ready at our word to attack," specifying five states where attacks will occur, those are Virginia, Maryland, Illinois, Michigan and California." Whether one agrees with Ms. Geller's methods or not, the attack on the Draw Muhammed event, but more importantly events subsequent to the attack on the event, have spectacularly made Ms. Geller's point for her, on a national stage, not just a political one. Ms. Geller was interviewed by Breitbart News, please read the entire interview, but the following two questions and answers, should be read before watching the video below, where Pamela Geller faces off against radical Imam Anjem Choudary on Fox News, Hannity, where Mr. Choudary, not only condones the threats against Ms. Geller, but suggests that she "put before Shariah court and tried and of course she would face capitol punishment," because she organized a free speech event in America. 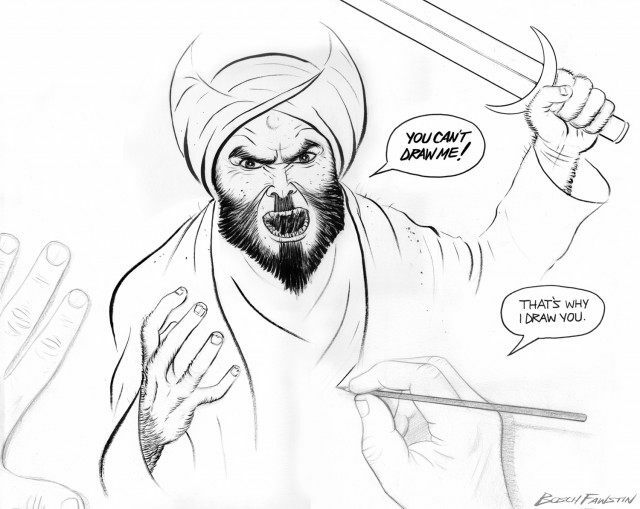 In the video below, Mr. Choudary confirms each and every assertion made by Ms. Geller, when he states "We’re talking about people who deliberately had a competition to insult the messenger Mohammad… If you saw the cartoons that Charlie Hebdo drew you would understand the anger. And now this woman was to draw cartoons or have people draw cartoons to insult the prophet knowing full well that this carries the death penalty in Islam… She should be put before Shariah court and tried and of course she would face capitol punishment." It is not only radical Imam's promoting the concept that free speech should be limited if it "offends" someone, which is a very slippery slope, but as can be seen below Megyn Kelly has a very heated discussion with Richard Fowler, where Kelly firmly aaserts "When people exercise their first amendment rights, and two jihadis show up to murder them, the relevant question at that time is not what were they saying... The more offensive the speech is Richard, the more protection it needs. That is how the first amendment works... I am concerned about the America you would have us live in. That is not the way it was set up." In the last video, Kelly declares that when free speech is attacked more than those killing over it, the "the jihadis are winning." Kelly even accused the media of drawing a “moral equivalence” between people who do offensive things and people who kill over those offensive things. She brought on Eugene Volokh to continue emphasizing the point, going after the media and CNN’s Chris Cuomo in particular. Watching the division over this latest terrorist attack on US soil by Islamic extremists and ISIS members/sympathizers, all that runs through my head is the headlined question.... what has happened to America? Since when is attempted murder and threats of assassination sanctioned and condoned? WHEN PAMELA GELLAR STANDS UP AGAINST THE MOST EVIL AND POWERFUL ISLAMIC SHARIA MOVEMENT OF OUR DAY AND COMES UNDER ATTACK BY KNOWN ISIS MEMBERS, WE NEED TO STAND WITH HER IN PRAYER AND INTERCESSION.WHAT ABJECT COWARDICE OF THE PRESS,THAT REFUSES TO IDENTIFY THE MONSTERS THAT ARE BEHEADING CHILDREN,BURNING MEN AND WOMEN ALIVE, AND CANNIBALIZING OUR BRETHREN ,AND MANIFESTING A BLOOD LUST FROM THE PIT OF HELL AGAINST CHRISTIANS WORLDWIDE DEMANDS THAT YOU STAND THIS DAY! NOW IS THE TIME FOR YOU TO SAY ENOUGH IS ENOUGH.THE FACT THAT CHRISTIANS AND PULPITS IN GENERAL ARE "SATANICALLY SILENT” ON THE SLAUGHTER OF OUR BRETHREN IS EVIDENCE ENOUGH THAT THE GREAT FALLING AWAY IS TRULY UNDERWAY.THE FACT THAT DHS AND THE FBI HAVENT EVEN CONTACTED HER OR ARE CONCERNED FOR HER PROTECTION IS PRIMA FACIA EVIDENCE THAT THEY ARE NOT GOING TO HELP HER-MAY THE GOD OF HEAVEN SEND HIS WARRING ANGELS TO STAND WITH HER AND MAYBE SOME WHEN OF VALOR WHO HAVE NOT BECOME POLITICAL EUNUCHS RISE TO HER DEFENSE!